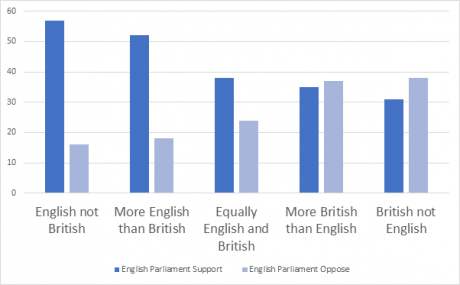 Voters tend to be more supportive of the principle that English laws should be made by MPs elected from England, than for the establishment of a new institution. Significantly, support varies considerably between those who identify most distinctly as English and those who are more British. The ‘more English than British’ already support the idea. Scepticism comes from the ‘more British than English’. So – leaving aside arguments about the pros and cons of such a Parliament, how could one become a reality? The demand for an English Parliament would need to grow in two, different, ways. Firstly, the current but muted demand amongst English identifiers would need to become more insistent. And secondly, support would need to develop amongst those for whom British identity is more important and for whom the appeal of a parliament based largely on national identity is much weaker. To these voters the appeal of an English Parliament will need to be as a civic and democratic institution that offers better government for all the people of England. It seems unlikely that either change will come about through public campaigning alone. Change is more likely in the context of events that force a debate about the constitution or governance of England. 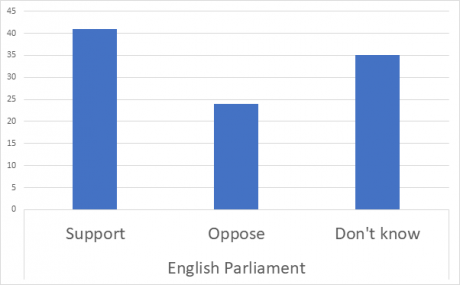 Some see the relatively modest levels of support for an English Parliament as evidence of little demand for change. But the idea retains consistent support even though it has few prominent national political advocates and when England and its governance are largely unreferenced and excluded from the national political conversation. It is quite possible that this resilient base of support for a more democratic England would only rise in a national constitutional debate, with some form of English Parliament (whether a freestanding parliament or a ‘dual-mandate’ Westminster) is emerging as part of the preferred solution. So what events might provoke such a debate? Events that force a wider UK constitutional debate, in which the position of England has to be addressed; or demand the recognition of England as a political entity. Predicting exactly when these events might occur is difficult – but there are three main pressures – constitutional (the formal legal relationships governing the union and its component parts), governmental (the way in which the current practical distribution of powers renders the government of the UK or its nations inefficient or ineffective) and political (the problems arising from the electoral and parliamentary politics of the current system). There is no sharp divide between these categories, and they are likely to work together, but they are a useful framework for analysis. A common factor is that England has no constitutional, legal or political status. Many tensions arise because England is absent from the constitution, governance or politics of the UK. A second common factor is that Brexit is a driver for change as it brings to the surface weaknesses in the governance, politics and constitution of the UK that might otherwise have taken decades emerge. In the UK’s asymmetric constitution, England alone is subject to the UK government on domestic policy and the extent of devolution varies across Scotland, Wales and Northern Ireland. Northern Ireland’s status has also been underpinned, uniquely, by international treaty. This distribution of power is far from settled, and unplanned change – such as implementing ‘the pledge’ made during the Scottish referendum – leads to pressure for further measures (including additional powers for Wales and the introduction of a limited form of English Votes for English Laws) that have inherently unpredictable and destabilising consequences. government reassert its authority even on issues that Scotland, Wales and Northern Ireland had thought were devolved. The return of powers creates serious anomalies – symbolised by UK ministers like Michael Gove (DEFRA) having to act both as the UK government for UK and England. The UK government’s actions have been challenged in the Supreme Court which is edging its way, quite unplanned, towards becoming a constitutional court for a country with no constitution. There are also, of course, the more obvious threats to the union from potential Scottish secession and growing support in Northern Ireland for Irish reunification. Recent reports on the UK economy, including the IPPR’s Commission on Economic Justice, and the Independent Commission on Industrial Strategy, have concluded that effective and inclusive economic growth is incompatible with the current levels of Whitehall centralisation. 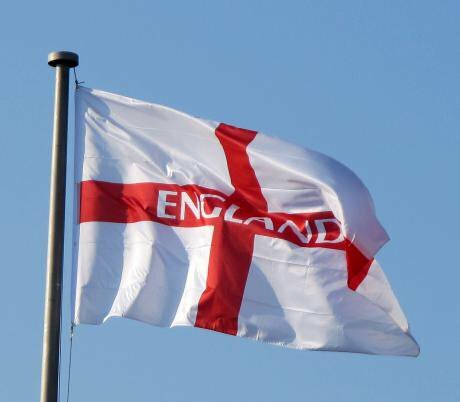 These reports typically do not explicitly recognise England as a unit of government, but once a serious debate about governance opens the English dimension will inevitably emerge alongside moves to decentralise England. At the same time the distortion of English local government finance away from the poorer communities towards wealthier areas (by the UK government) is unsustainable as councils come close from social care costs. Criticism is growing of the relatively privileged position of London, a by-product of it being the seat of a UK government not subject to an England wide-polity. The design of devolution emphasised the transfer of powers to the nations but paid less attention to the need for practical cooperation between them. Outside the certainties of the EU, new coordination mechanisms will be needed but there is currently no adequate means to represent England in that process. The UK has four national political communities with distinct debates in which different parties compete and win. Uncertain electoral outcomes increase the possibility of governments whose legitimacy to govern both England and other parts of the union is questioned. Not only may the UK government to have a different colour to the devolved administrations but it may rely on non-English party support. In 2015, fear of SNP influence on a Labour minority government helped to deliver a Tory majority. The current polling suggest that Labour could face the same questions at the next election. Conservatives dependence on DUP support has attracted less public attention but were Labour widely seen as the government-in-waiting the legitimacy of the current arrangement (and its cost to English taxpayers) would be more widely questioned. ‘English issues’ are also likely to come to the fore. The large minority of English residents who are politically important. They played a large part in the Brexit decision and most English ‘swing’ constituencies have a higher proportion them. English parties will be under pressure to engage with English voters and to ensure that a healthy democracy includes the ‘excluded’ English. ‘Work-arounds’ and sticking plaster responses are possible to these pressures and, in the first instance, quite likely. But the more that arise and they combine together, the greater the pressure for coherent constitutional change. What will be striking is how many could be more easily resolved if England nationhood were recognised. It would ensure that England enjoyed its own democracy and place within the union. At the same time, it would remove the confusion between English and UK government and circumscribe England’s pretensions to speak for the UK as a whole. Labour is already committed (if somewhat vaguely) to a constitutional convention that might embrace a federal UK. Others, perhaps for different reasons, may also see the value in change.